Getting ready to go back to Work! | Call Me Mummy!! Anjie didn’t cry but she wasn’t her usual smily self, she just woke up when I got to the office, darn! About an hour after I left work and went to the market there she was smiling at total strangers! The cheeky girl!! I’m planning to start out part-time and gradually ease into full-time at work and have requested it, so fingers crossed. But that’s not the best part, the best part is my mother-in-law is in TOWN!!! Yipppppeeeeee!! That means she’ll be looking after her grandchild while we’re at work, how wonderful is that! 🙂 Anjie would still go to the nursery but probably just once a week so she can learn to socialise and share with other babies and toddlers her age. So right now I’m looking forward to going back to work more and more! Fun times! During the week we also went down to Surrey for my brother-in-law’s graduation. It was a bit of a crazy trip as we left Leeds 5.30am (!!) and got back to Leeds around 10pm that same day! By this time Anjie was a bit cranky as she hadn’t moved much all day! We had to get her out of her car seat quite a bit to stretch out and eat during the drive. Overall it was fun and she did sleep through most of the 3.5hr journey so had a nice time especially as Anjie met her paternal granma and some cousins too! ← How are we Crawling, Standing and Sleeping…? Hi Tee. U sure are a Super Mom by now. U have your hands full. Its all good. It all keep u on your toes….. Thanks dear! 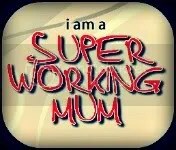 I’ll be a proper super mum when I resume work! 😀 fun times!